June 1, 2014 prompt: It’s been said that patients who are able to talk about what they would do without their Headache or Migraine, tend to be less depressed and more hopeful. Some patients have lost the ability to dream about their lives without the present taking hold and destroying their ability to dream of something better. What would you do if your dream of a pain and a completely symptom free life, came true? It took me awhile to unhook my feelings about this topic. I wanted to write about what would’ve (or in my opinion should’ve) happened if I hadn’t been struck with migraines at the age of 19. I’m very bitter about that and probably always will be but there’s no way of knowing what would’ve happened so I have to focus on what would happen if I woke up tomorrow without the aggravating migraine I have right now (which is why this post is not up to my usual standards) and knew that the rest of my life would be completely migraine-free. I think I would unfortunately spend a lot of time doubting that I would truly live a migraine-free existence. Having migraines makes me feel like I’m waiting for the other shoe to drop, so I’d be suspicious of how and why I didn’t have migraines anymore. I’ve tried so many treatments, medications, herbs, both Eastern and Western medicine that the promise of a complete cure would take a long time for me to trust. That being said, let’s say I could trust it…what would I do? I’d love to make plans and be able to know that I’d be able to keep them. I’d love to spend time in the sunshine without worrying that the heat and light would trigger a migraine. I’d love to enjoy thunderstorms like I did when I was a little kid, instead of being holed up in my room, either in pain or waiting for the inevitable pain to come. Working at full-capacity, full-time, at a job that I love: I miss that so much. So many amazing opportunities have been dashed because of migraines. I would travel more, eat and drink all the wonderful things that are triggers for me. I would sleep better, laugh more, and be less anxious. I’d be like a whole, normal person again. Migraines are terribly difficult and painful and isolating and I can’t help but feel broken as long as they are a part of me. 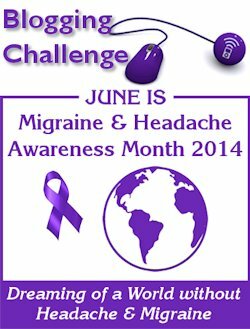 I’d advocate for Migraine Awareness; I’d have the strength, the energy, the money, and the persistence to do so. In all, I’d be done with what I call my “Ariel Syndrome”…you know, from “The Little Mermaid”? I’d be able to stop wishing to be part of another world. I’d be a part of that world. Wow this post – Ariel Syndrome – brought me to tears because you sound so much like me. I was reading the post to my husband and had to pause to swallow and blink back the tears. It’s comforting to know that others understand what I am going through. Please know you are not alone. Thanks for sharing!